As someone who enjoys music and appreciates its finer points, you have invested in the best audio equipment available in the market to get the full experience. But when you play your favourite track and are unable to get the full sound experience, don’t blame the technology that’s playing your music. Look around, it’s the room – the room acoustics, to be more precise that’s keeping you from enjoying your music. When it comes to designing home music rooms, ‘small room acoustics’ can make or mar the audio experience. 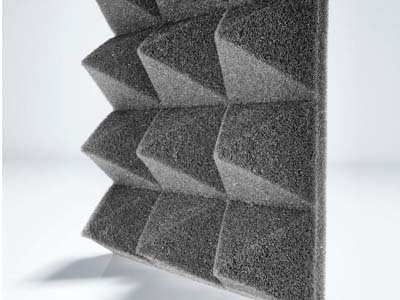 Cheops pyramid acoustic panels from Acoustica offer an affordable solution for tuning small spaces. Acoustica customer David recently installed Cheops in his home listening room. Factors such as the placement, characteristics and amount of absorption and diffusion are critical in smaller acoustic spaces such as listening rooms. According to David, his experience with Cheops has proven that there are incredible improvements that can be made to the music experience at home. He adds that this can be achieved at relatively little cost, by treating a room with dedicated acoustic products rather than spending more money on increasingly expensive audio components. Cheops acoustic panels feature a pyramid design, which provides the greatest absorption area and captures reflected sound from all directions. Cheops is available in 14 standard colours and a custom colour option for seamless and stylish home décor.